The Kriváň spa hotel is the main building belonging to the Bohemia-lázně company. The Kriváň spa hotel is the main building belonging to the Bohemia-lázně company. The biggest advantage of Kriváň spa hotel is its location right in the centre of Karlovy Vary, close to the Sadová and Mlýnská colonnades, but only a few minutes' walk from the main shopping street of the city. Another non-contentious advantage is a modern, newly furnished balneotherapy and wellness&spa centre with more than 45 procedures. Non-stop spa and emergency doctors and nurses' services guarantee the quality of care provided. Today's Kriváň spa hotel originated by connecting several original buildings built at the end of the 19th century in the historical style and offers comfortable accommodation in 202 modern furnished rooms of a 3-star category (83 single bedrooms, 111 double rooms and 8 suites). Meals are provided for clients in several hotel dining rooms, which serve meals prepared according to well-known dietary principles. Clients can choose between our offer of half or full board. Breakfast is served in the buffet style. During lunch and dinner, there are side dishes, salads and cooked veggies served in the buffet style. The main meal is served. Clients can choose from a variety of dishes. The Kriváň spa hotel is known for its quality spa treatment care. The care is provided by qualified doctors, nurses, physical and massage therapists. The company Bohemia-lázně has recently invested considerable financial resources in the construction and renovation of its balneotherapy facilities and now boasts brand new, modern top class spa treatments. There is also a new swimming pool with a spa&wellness centre. All treatments are based on natural healing sources – thermal spring water and peat. Parking is provided for clients in a private parking garage with the capacity of 54 spaces. The parking garage is fully automated, protected by security cameras. Karlovy Vary is a leader in the treatment of diseases of the digestive tract and metabolic disorders. 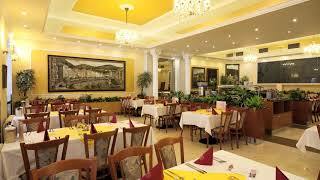 Karlovy Vary springs have been helping for centuries, therefore do not hesitate to entrust yourselves to experts. Our professional team is ready to assist you. The special reconditioning and curative treatment program focuses on preventing locomotive organ disorders and supporting the digestive system. An important way of prevention is sufficient movement, a healthy lifestyle and avoiding excessively one-sided physical exercise and overloading of the joints in general. The 8-days program includes 14 balneological procedures. Do you feel tired? Do you not have time for yourself? The pace of everyday life does not provide much time for relaxation and rest. Discover the city of thermal mineral springs – visit Karlovy Vary, a gracedul spa. Relax, leave your day-to-day worries and stress behind you and do something for your health! An active lifestyle opens the door to longevity and enriches your life. The program focuses on improving your physical condition.